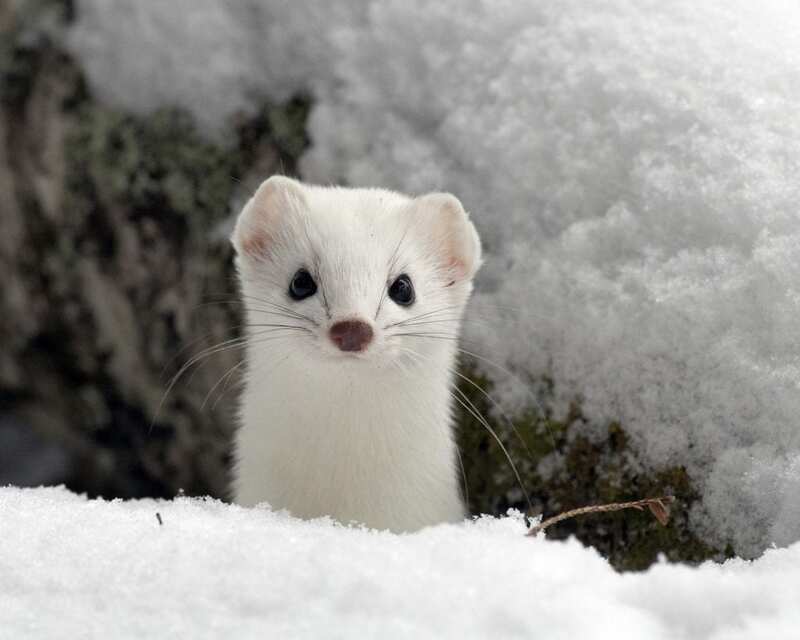 The Adirondack’s smallest weasel is 23-31 cm (9-12 in) in length, including the short, 5.4-8.5 cm (2.1-3.3 in) tail. Ermine weigh 60-110 g (2.1-3.9 oz). Females are one-half to one-thirds the size of males. The ratio of tail length to total (combined head-body length) is the only reliable means of separating large ermine from small long-tailed weasels (M. frenata) because of their similar appearance and size. The tail of the ermine is less than 44 percent of head-body length. The ermine had a long, slender body and neck, flat triangular head and short legs. The small, beady eyes are black and the ears are short, rounded, and furred. The upper parts of the body are brown and the lower parts white to yellowish white, except in winter (December – March or April) when the coat is white. The tip of the tail is black in all seasons. Photoperiod, modified by ambient temperature, governs the biannual molt.